usually sold near churches in the Christmas season, puto bumbong is gelatinous rice of purple color steamed in bamboo tubes then served on banana leaves with grated coconut, butter and sugar. Have you ever wondered why the puto bumbong is purple color? 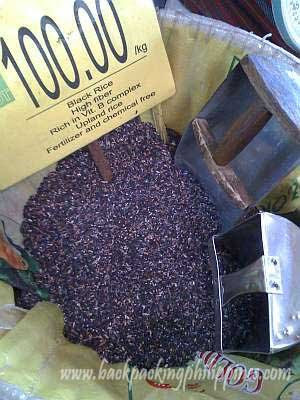 You will usually say it's due to the violet food coloring added to the rice part of recipe but the truth is this: original, authentic puto bumbong recipe uses a variety of black rice that gives it the purple color and the unique taste. 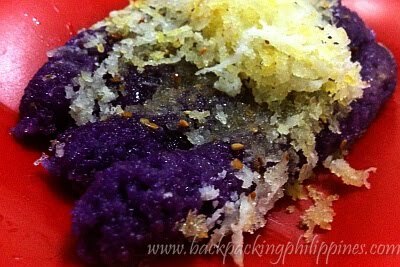 typical puto bumbong you buy on the roadsides now are made from glutinous rice (malagkit) and mixed with food color for that purple color. So how would you know the authentic from the fake one? ask the vendor or you can guess from the price. happy happy new year. may you find more adventures this coming year. peace and blessings of good health to the whole family. you know, not being a fan of kakanin back home, it is only recently here in usa that i tasted puto bumbong and i love it.